For all our best intentions, it became an inadvertent 10 km journey of back-tracking. We started the day in a compassionate-mind state, choosing only to cover what distance would be possible. That got us to the car from the kitchen. 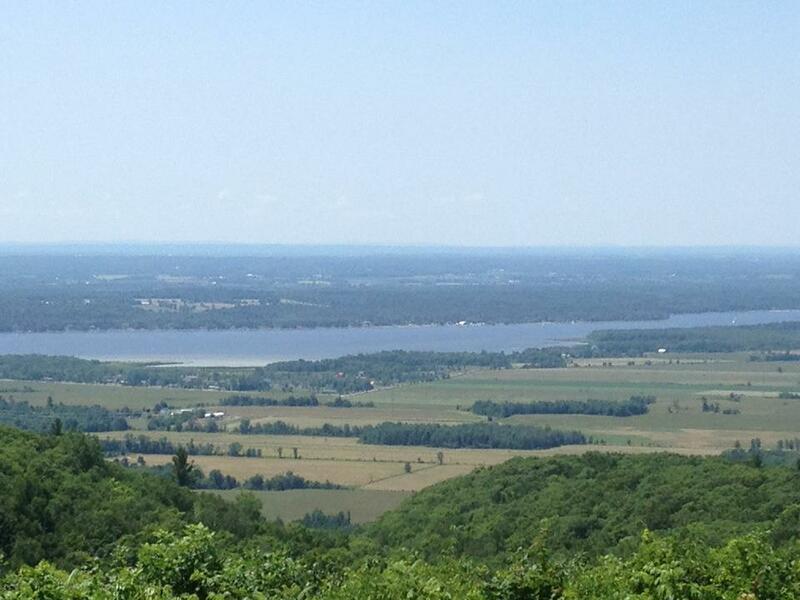 It was a good start followed by an hour-long drive to the Gatineau Hills and Trail #3. Sure it was coded as “difficult” but we had that compassionate-mind which was going to allow us to be wherever difficult joined us on the trail. Trail #3 starts out at a lovely lookout point, Étienne Brûlé, and descends quickly to a flat run through the forest. The implication of that drop didn’t escape me; it would be there as the last leg of the hike when we returned. I knew better than to project into the return trip and set my mind into my feet. Mu. The trail markers named #3 the Huron Trail which crossed others that lead to Meech Lake, the Western Trail, or up to the Rampart Lookout. It was fun and games; we were actually enjoying the slopes and slides, enjoying the feeling of effort and lifting of the mental fog that held us earlier in the day. Alone on the trail, I was happy when we met another hiker. My mind could finally stop trying not to think of black bears, hungry black bears, hungry black bears looking for a quick meal deal. Mu. We stood and chatted for a while, the hiker subtly assessing our capabilities, asking us if we’d been on these trails before. And where were we headed and when had we started out and yes, the trail up to the Rampart Lookout was quite easy. No, not steep at all; a few ups and downs but not steep. I was so relieved I failed to note he was wearing a tee-shirt that advertised the Meech Lake Trail; he may have been inclined to experience a different version of steep. We overshot the trail leading to the Ramparts and wandered about 1.5 kms further east before turning around. Getting to the lookout from the trail junction was another 800 meters; a kilometer and a half there and back again. I dithered about it as the start into the trail looked chancy and then decided that trusting in difficult to join us had worked so far. It met us about two-thirds of the way up and set its challenge. Not in the steepness of the trail but in the sheer drop off the edge of my mind as old stories surfaced about what should have been, what is, and what may never be. Mu. Mu is this large, this wide, this deep, and this penetrable when you’re sitting on a log wondering why 800 meters is so large, so wide, so deep and so impenetrable. It sits on your chest and clutches at your throat, willing you to be someone else. Someone who says Mu! to wanting the world to shift, the ups and downs to smooth out, the forest to open and the way to be passable. An entire herd of mu’s!